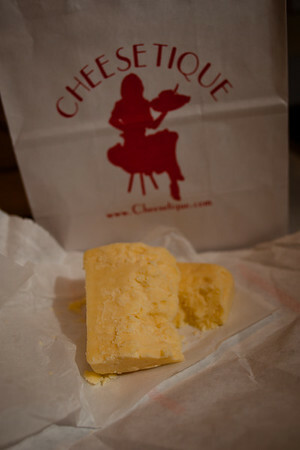 January 18, 2012 - Quebec 7yr Cheddar from Cheesetique. Went to dinner at Cheesetique. We were going to go to Screwtop, but aborted that, after not getting seats. Dinner was pretty good. Picked up some of this cheddar afterwards. It is just wonderful stuff. Very piquent flavor, a bit dry and crumbly texture. There's some crystals as you bite into it. Know its available a few other places around, but this alone makes the trip to Cheesetique worthwhile. Also grabbed a chunk of Chimay cheese, which is not pictured here. Photo was taken with the 5dII, 28mm Zeiss f/2.0 ZE lens and the 430ex flash. The flash was on a camera stand to the right of the camera. Had a bit of paper around it to try to limit the spill of light around the cheese. This is a bit the opposite of yesterday's photo - this is just a sea of light colors. Needed to keep from overexposing it, while still maintaining some contrast.